Based in Bolton, we cover all surrounding areas including Horwich, Wigan, Manchester & Bury. to bring out the beauty of your home. At J& J Carpets and Flooring, it is all about providing a professional and reliable service at your doorstep. We understand that your new carpet or flooring is meant to be part of your home, and that is why we supply high-quality products to compliment every household. We can help you customize your home with a range of carpets and flooring to suit your taste. Our expertise in carpets and flooring gives us confidence to solve all your carpets and flooring needs starting right from your home. At J& J Carpets and Flooring, we help you choose the right carpet or flooring to suit your needs. Our goal is to ensure that your carpet or flooring adds value to your home. We do this by offering a home service, where you can browse a large range of sample products at the comfort of your own home and at a time to suit you. We offer professional and friendly advice and we can work with you according to your budget. We make it easy for you to choose us for all your carpets or flooring needs. At J& J Carpets and Flooring, we pride ourselves to be honest in our pricing and dealing. No gimmicky sales tricks or false discounts to mislead you in to buying our products. Our prices are open with no hidden charges. You will always get value for money with us. All our services are professional and reliable because we have our brand to protect. At J& J Carpets and Flooring, we value your hard-earned money and, therefore, we pride ourselves on creating the best experience for you. With our products and personalised service, you can take your time to make the right choice with confidence that you would get the high-quality product and a professional service. Buy with confidence from our wide range. The story of J&J Carpets and Flooring is quite interesting and it started just over 15 years ago. It began when John, a 17-year-old young apprentice, started working in the flooring business in his hometown of Yorkshire for a local family business. He spent the next few years learning the fundamentals of this trade; from the residential sector to the high-end of the commercial world. His commitment and hard work later paid him off, and he gained promotion to the Store Manager of the same company he had joined as an apprentice. What an achievement! John then moved to Bolton to settle down with his partner, where he decided to make the switch from being employed to starting up his own carpet and flooring business. He now provides a reliable and professional service within the flooring industry and continues to create a specialised and personal journey for his customers. 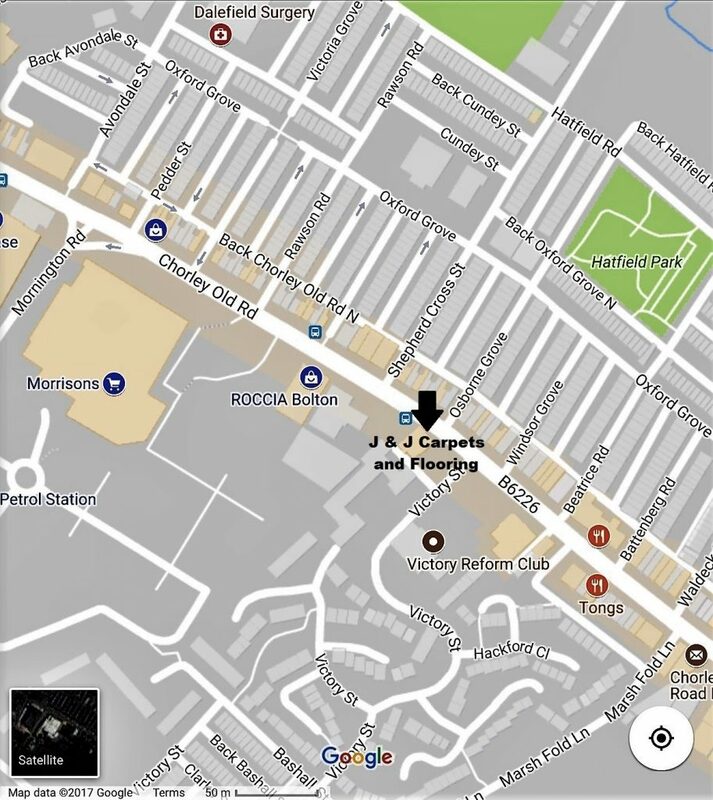 "We are proudly based at our brand new store which is only 10 mins drive from Bolton Town Centre"
At J & J Carpets and Flooring, we pride ourselves to have your best interest at heart. We not only provide highest quality of carpets and flooring solutions, but also help you with professional and expert advice when you need it. Our unique 'Choose at Home' service allows you to view and match our products at the comfort of your home, and at a time that suits you.